A beautiful emerald-cut garnet stone is at the center of attention in this beautiful 14K yellow gold solitaire ring from Apples of Gold Jewelry. 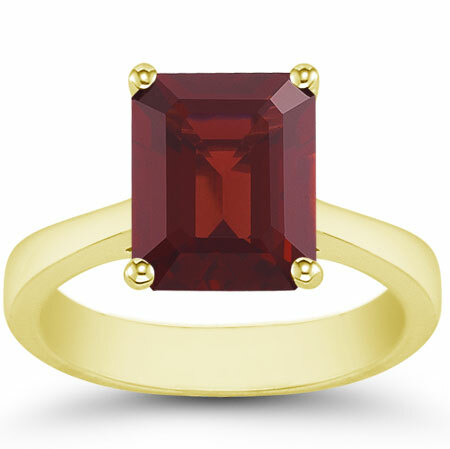 The deep red of the garnet, almost a wine color, sparkles against the 14k yellow gold of the ring. The AA rated gemstone is a 8mm x 6mm emerald-cut stone, and the solitaire design is fun, bold, and stylish for any occasion, whether it is paired with another ring, as part of a bridal set, or worn on its own. We guarantee our 8mmx 6mm Emerald-Cut Garnet Solitaire Ring in 14K Yellow Gold to be high quality, authentic jewelry, as described above.